Barnett Park – 4801 W Colonial Dr.
Conway Water Treatment Plant – 3590 Manatee St.
Cypress Grove Park – 290 Holden Ave.
Fort Christmas Park -1300 Fort Christmas Rd. Harrell Road – 8503 Trevarthon Rd. NW Water Treatment Plant – 701 W McCormick Rd. Rose Place Park – 8200 Old Winter Garden Rd. Across from Renaissance Senior Center – 3800 S. Econlockhatchee Trl. West Beach Park Addition – 9227 Winter Garden Vineland Rd. For questions or more information, contact 3-1-1. 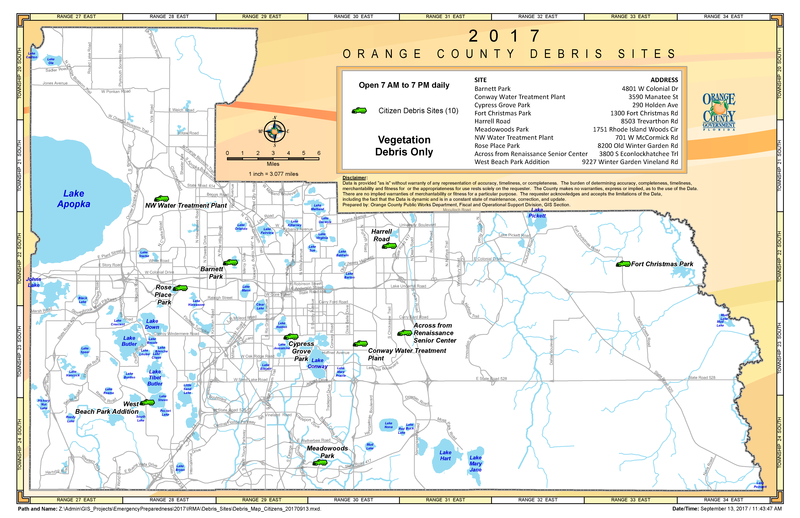 On Thursday, Sept. 14, 2017 Orange County’s Debris Removal contractors will begin pick up of vegetative debris only. Orange County has three (3) vendors that will be working on routes for debris pick up Residents may bring vegetative (trees/limbs etc.) to the curb for pick up by our contractor based on the schedule we will provide for pick up in their neighborhood. Residents, nor independent contractors, may NOT drop debris at the contractor sites. Vegetative debris must be separated from construction materials, household hazardous waste (e.g., paint) or large electrical goods (e.g., refrigerators) when placed on the curb. Due to power outages caused by Hurricane Irma, a sewage overflow has occurred adjacent to Lake Jessamine – located near the Conway area, as well as to Lake Pearl – located near the UCF area. Residents should avoid all contact with these lake waters and avoid recreation in the lake until further notice. Orange County Government is monitoring the situation and will perform sampling of the lake water during the next few days. An update will be provided when the lake is safe again. 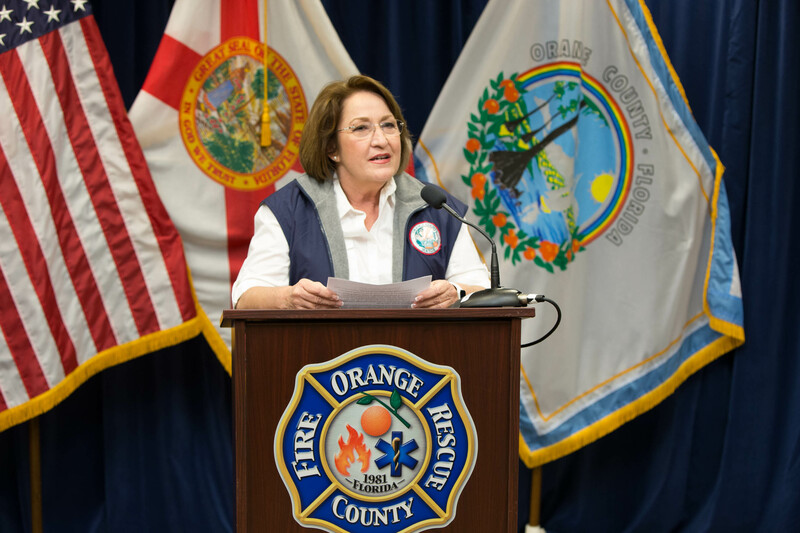 For questions, please contact Orange County’s Environmental Protection Division at 407-836-1400. Due to the high water levels in many area lakes, the Orange County Environmental Protection Division is advising residents to avoid creating wakes when boating on our lakes. Even after a hurricane has passed, our local lakes and rivers may continue to increase for several days as their watersheds drain downstream. It can take days for lakes that are landlocked or have limited discharge capacities to return to their normal water levels. Wakes produced by ski boats, jet skis and other motorboats can cause severe erosion and damage to boat docks, seawalls and even property such as pools and other outside structures. In addition, with high lake levels, boat docks may be submerged with no visible signs of their presence at the surface. These submerged items can pose serious threats to personal safety. Please take precautions for your own safety and respect your neighbor’s shoreline as you boat on our lakes during this time of high water levels.